Dropshipping is a business activity that has exploded in popularity over the years. Thanks to the widespread nature of the internet, and the solid platforms that drop shipping stores are mostly built on, it has enabled virtually anyone to open up their dropshipping business within a short period of time. Furthermore, the infrastructure on the internet for marketing and scaling is also advanced and quite affordable, allowing people to start their dropshipping business with not much money. But as with everything, it’s simply not enough to just set up your drop shipping store and then wait for the customers to come. Because the fact is that it’s not quite that simple. Especially now that there are more people than ever doing it, and the competition is thus tougher than ever. Dropshipping has a large number of benefits, but in order to succeed with your drop shipping venture, you need to know what to do and when to do it. This can, of course, be difficult when you’re just starting out, but in this article, we’ll share some of the top dropshipping tips to help you succeed within your space. We’ve briefly scratched the surface of dropshipping and what it is, but let’s sort it out once and for all before we dig into more complex things. Dropshipping is a business model where an e-commerce store does not have its own products in stock. 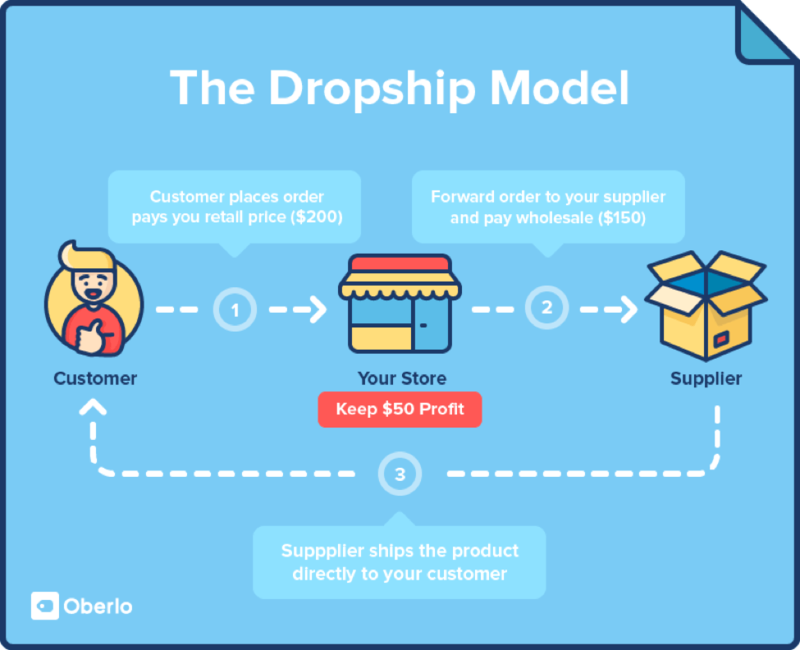 Instead, the dropshipping business acts as a middleman, and preferably, does it so smooth and slick so that the buyer does not even notice that the product isn’t sent from their warehouse. When a dropshipping merchant sells a product through its channels, it notifies the supplier, with which they have contact/agreement/deal with, and tells them to ship the goods directly to the buyer. This means that the drop-shipper hardly ever see any of the products they sell. Dropshipping allows merchants to focus on what they are actually good at, and hand over the things that they aren’t as good at, for example, product management, packaging, shipping solutions, etc. Probably the key benefit of drop shipping is that as a merchant, you avoid the stock costs and risks of keeping your own stock. Having stock is always a tricky thing for businesses because you’re often going to be left with stock that is difficult to sell. Also, having stock costs a lot for businesses, and this is why drop shipping streamlines this whole process. Lastly, another benefit of drop shipping is that you don’t have to hunt assortments and products to the same extent as the business that has its own stock. Okay, so you’ve set up your dropship e-commerce website. How should you go about getting customers? I cannot emphasize just how important this point is. Somehow, some people tend to neglect customer service when they start their dropshipping business. But the fact of the matter is that customer service is probably the most crucial part of a successful drop shipping business. Some people also believe that the customer service part of dropshipping is the supplier’s responsibility for some reason, but if you do drop shipping correctly, your customer should never be in contact with your supplier. Therefore, in your customers’ eyes, you are the business that provides the product, and therefore, you are the first person they will contact. Whether they want to complain or ask a simple question. You can begin with the easiest rule of thumb, and that is to respond to each and every customer service inquire message you receive from your customers. For reference, 80% of Customer Service Inquiries Go Unanswered on Social Media. At the same time, businesses hear from 4% of its dissatisfied customers. And as a drop-shipping business, if someone has ordered from you and are satisfied, there’s a great chance that they’ll buy from you again. But on the flip side, if they aren’t happy with your service, they’ll never buy from you again, and they’ll probably tell their friends about their experience. Don’t underestimate customer service, because this will really be the foundation for your business. I would even dare to say that customer service is even more important for drop-shipping businesses since you don’t have any own products, and normally no own product designs. So if you want to succeed, you need to provide customer service that is above and beyond, as this is one of few ways you can separate yourself from your competitors. This is not mandatory, but it is ideal. If you haven’t tried the products you sell, you cannot put yourself in your customer’s situation. In fact, if you have never tried the products you sell, your customers will know more about our product than you do as you haven’t really tried it ”in the field”, and will thus have a hard time reacting to any complaints or feedback about the products that they may have. Test your products and try them in different areas and situations that your customers may use them in. The more you learn about the products, the easier it will be for you to sell your products, and tell your customers about it. As an addition, when you have the products, you’ll also be able to take your own, higher quality images as opposed to the standard images that most drop shippers use. Not only will this help you portray your products in a more appealing way, but you’ll also be able to photograph your products in a distinct and consistent style that allows your customers to instantly recognize your images. This will also be a way for you to build your brand. This is the first step that you should do before you set up your drop shipping store. This is crucial for success. As mentioned, the competition among drop-shippers is tough, but it is not equally tough in all niches. Sure, some large drop shipping sites strive to offer millions of products in thousands of different niches, but in order to succeed with this, you need a huge amount of resources in order to cut through the noise and stand out from the crowd. It is far better and far easier to focus on one niche as it means that you don’t spread yourself thin. It will also allow you to become an expert within your field, and thus being able to serve your customers better, but also become the natural for customers looking for products within your niche. Also, you don’t just want to choose a niche that you ”think is good”. The niche you select should be well researched and well-planned. To choose a niche, begin by asking yourself ”what am I passionate and interested in?”. Not only will it be much more fun start a dropshipping business around something that you’re genuinely passionate about, but it will also allow you to offer a better service to your customers as you know what you are talking about. Lastly, when you sell something you’re passionate in, you’ll be included to want to learn more about that product and the industry you’re operating in, and you will thus be more knowledgeable in your field. Your customers will sense this, but since chances are that you already know a thing or two about your niche, and are somewhat conversant in it. As for marketing your products, it will also be a lot easier when you focus on one niche. The reason is that you’ll only have to reach one target audience as opposed to a new one for each niche product you have on your site. When you can attract a group of people interested in a specific niche or product in that niche, there’s a chance they’ll also be interested in other products related to that. Something to consider when choosing a niche is obviously profitability. Some niches simply are more profitable than others. Generally, it is better to select a niche with higher priced products, because it normally costs equally much for customer acquisition, whether you’re selling a 10 dollar product or a 1000 dollar product. Something to consider when choosing a niche is shipping costs. While your supplier handles the shipping, they’ll charge for it. And if the shipping is expensive, it means that you either have to raise your prices or charge a high cost for shipping. If your shipping is too high, you’ll naturally scare customers away. Shipping costs are mostly based on weight, and therefore, it is ideal to find products that are easy to ship and which don’t cost a fortune to ship to customers. Before you dig into a niche, you want to make sure that people are actively searching for your niche, and that there is a large enough customer base for that product. A good place to start is Google’s Keyword Planner and Trends to check for keywords related to your niche to make sure that there is an interest in this niche. Something that is often neglected is analyzing and optimizing. A lot of drop shippers focus solely on customer acquisition and not what happens after that, or how the customers are acquired. Make sure you invest lots of time and effort tracking all of the data and metrics available to grow your business. Use all analytics at your disposals such as Google Analytics traffic and Facebook conversion pixel data. When you are able to track every single conversion, you can know where the customer originated from and how they came to your site, which eventually led to a sale. This allows you to identify the things that work and the things that don’t. Next5 Reasons Los Angeles is the Online Marketing Capital of the U.S.